In this post we will learn about how to integrate Spring Batch with Quartz Scheduler to run batch job periodically. We will also see how to handle real world scenario where periodically, files are received dynamically (they may have different names on each run) in some input folder which can reside on file system (not necessarily the application classpath). We will see JobParameter usage to handle this scenario. We will also witness usage of Tasklet to archive file once they are processed. We will read (one or more) flat files (on each run) using FlatFileItemReader and write(append) all the records to a common output flat file using FlatFileItemWriter. Let’s get going. Now let’s add all contents mentioned in above figure. Below are the input files with ‘|’ separated fields which we will be putting (one or more) on each run in our input folder on file system (E:/inputFiles). Each Record in above files represents name, date of birth and precentage. ItemProcessor is Optional, and called after item read but before item write. It gives us the opportunity to perform a business logic on each item.In our case, for example, we will filter out all the records whose percentage is less than 75. So final result will only have records with percentage >= 75. Above class contains actual spring batch job logic. Method performJob will be called by scheduler periodically. On each run, we check a specific input directory where input files can be found. If files are present, then we create a map containing the actual file name plus a date (to make it unique among job parameters), and pass this map as an input to JobParameters followed by launching the job using JobLauncher. This map we will be referring to in spring context to create a reference to actual file resource. Tasklet execute method is called once the STEP above it (in job) is completed successfully.In our case, once we have processed our input file, the file will be archived (moved to a different folder E:/archivedFiles with timestamp suffixed).Notice the usage of jobParameters to get the filename of file we processes in previous STEP. Add the Quartz Job bean. Quartz scheduler calls (on each scheduled run) executeInternal method of class implementing QuartzJobBean. In this method, We are simply calling performJob of our Spring batch job class we created in step6. But we need some way to tell Scheduler about how to find our spring batch job bean which will be declared as a bean in spring context. To do that, we have used an implementation of ApplicationContextAware. And finally, we also need to configure Quartz CRON trigger to specify when and with which periodicity the job should run. A BeanPostProcessor that registers Job beans with a JobRegistry. 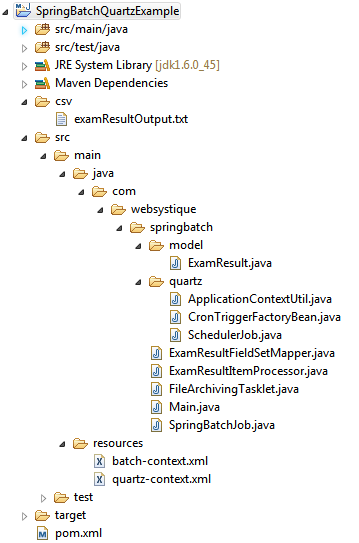 which uses jobParameters along with Spring expression language to refer to the file resource whose name was set (as jobParameter) in our batch job in step6. Note that you don’t find such flexibility with regular FlatFileItemReader or MultiResourceItemReader configuration (using file: or classpath: to refer to actual resource) which once refereed to a resource, can not recognize a new resource on next run. Rest of configuration is pretty obvious. We have declared a FlatFileItemReader (whose resource property now refers to the bean ‘inputExamResultJobFile’ described above) to read input flat files, FlatFileItemWriter to write the records to a specific file.We have also added a Tasklet in our job which we use to archive the file once processed. Above we have declared a SchedulerFactoryBean which schedules the configured jobs (via jobDetails property) for mentioned time/peiodicity (using triggers property). In this example, job will be run each minute. Rest is the declareation of beans we have created above. Please visit Quartz Documentation to learn more about Quartz schedular usage. Run above class as Java application.Above class will load the application context and as a result, will start the scheduler.Job will be run each minute. No Input file found, Job terminated. Note that records not meeting the 75 % criteria(thanks to ItemProcessor filtering) are missing. Finally, check the archived folder E:/archivedFiles , you will find the archived files with processing timestamp suffixed.